March 22, 2018 • by Mariruth Leftwich Ph.D.
Mister Rogers postage stamp, 2018. Courtesy of the U.S. Postal Service. As I spoke, I was struck by the similarities between this commemoration and that of another icon I have been deeply immersed in, Elvis Presley. My doctoral work was based at Graceland, Elvis’ home. Having spent many hours conducting research at his home and years researching him, Elvis is never far from my thoughts. Elvis was honored on a U.S. stamp issued in 1993 as part of a music icon series, although some fans argued he should have received the kind of solitary recognition that Fred Rogers will be receiving. The more I thought about the fact that both of these American icons were honored by the Postal Service, the more I drew connections between them. 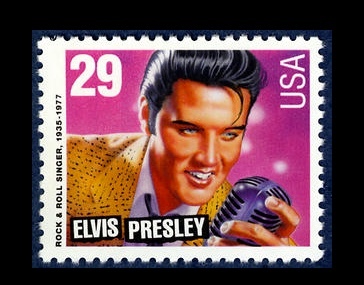 Elvis postage stamps are released by the U.S. Postal Service, January 8, 1993. Courtesy of the Smithsonian National Postal Museum. Fred Rogers and Elvis Presley were part of the same generation, born only seven years apart (Fred Rogers in 1928 and Elvis Presley in 1935). They both began their careers in the mid-1950s. In 1954, Elvis made his first recording at Sun Studios in Memphis, while Fred began working at WQED, Pittsburgh’s public television station, on the children’s show “The Children’s Corner.” Both men began pushing boundaries in their mediums, with Elvis’ “That’s All Right” ushering in the new rock ‘n’ roll era, while Fred worked to develop children’s television programming that focused on education and empathy rather than traditional gimmicks. 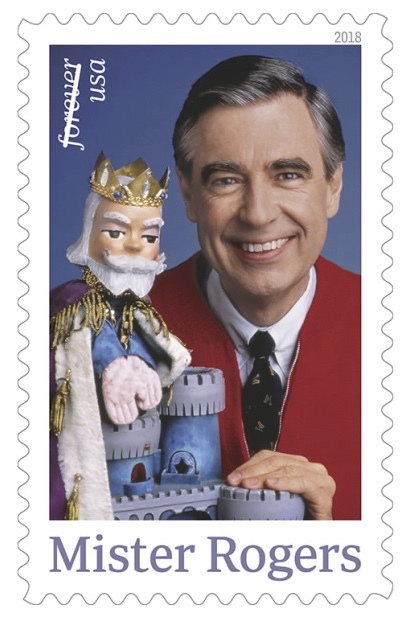 Postal stamps are reserved for people who make an indelible mark on our culture, which can be said of both Fred Rogers and Elvis Presley, as they made incredible impacts on their media forms and audiences. Their appeal and effect were linked to their personalities, which enriched their work in immeasurable ways, whether on stage or on screen. When I was interviewed by the Postal Service, they asked me to reflect on the commonly heard statement that Fred Rogers was just as authentically kind as the Mister Rogers ‘character’ seen on television. Certainly, every account I have heard from those who worked with Fred or met him, of which there are many recollections here in Pittsburgh, describe how genuinely caring and good-hearted Fred Rogers was in real life. Your beautiful letter meant a great deal to me. It really gives me a warm feeling to know that you have such fond memories of our program and that you continue to feel close to what we offer. The feelings that you shared are encouraging to all of us here. . . You are a special person, and we will remember with pleasure that you are part of our television Neighborhood. Fred Rogers’ authentic personality shined through in all that he did, from his television production to his encounters with people in everyday life. 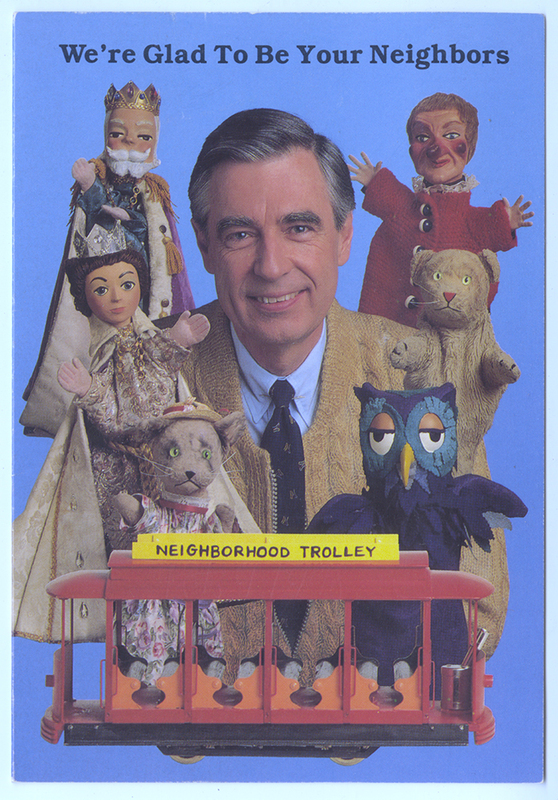 Puppets, central characters on the show, also held a special place in the childhood of Fred Rogers. As a child, Fred was often ill and confined to his bed, where he would play with puppets. Each puppet portrays a different personality type, making the characters relatable to a young audience. Jonathan Halpern Collection, 2016.0154, Detre Library & Archives at the History Center. 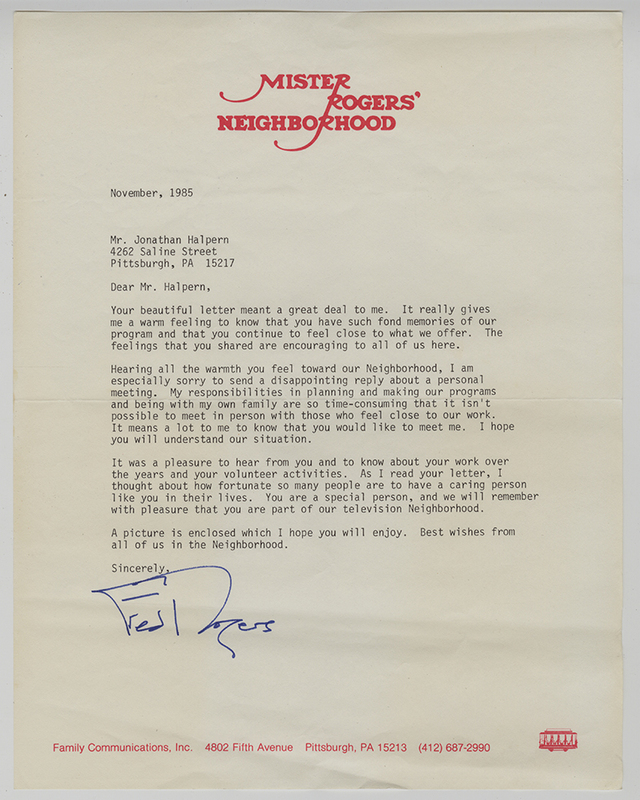 Letter from Fred Rogers to Jonathan Halpern, November 1985. Jonathan Halpern Collection, 2016.0154, Detre Library & Archives at the History Center. Whatever he emanated on the stage was what he was when he was off. I think people just felt his presence, it came through in his music, it came through on stage, his being was what was coming through. I just think he touches the spirit . . . his spirit came through in whatever he did and it would touch other spirits. This statement is indicative of the relationship that both Fred and Elvis had with their legions of fans and their ability to convey their personalities through mediums that affected their listeners and viewers in powerful ways. Both Fred Rogers and Elvis Presley were innovators in their emerging mediums, forging new paths, and making their stamp on American culture with legacies we can still see today. Elvis fused together a range of musical styles and produced rock ‘n’ roll, while Fred pulled from multiple disciplines and his artistic talents to create a new avenue for television programming. Their placement on postal stamps is indicative of their cultural impact and commemorates their unique contributions, just one of the many connections between these two surprisingly similar icons. Doss, E. (1999). “Elvis Culture: Fans, Faith, and Image.” Lawrence, Kansas: University Press of Kansas. Note: The Smithsonian’s National Postal Museum calls the 1993 Elvis stamp the most popular U.S. commemorative stamp of all time. Elvis was honored again in 2015 as part of another music icon series, with a 1955 photograph on a forever stamp. Marcus, G. (1997). Mystery Train: Images of America in Rock ‘n’ Roll Music. (4 ed.). New York, NY: Faber. Mariruth Leftwich, PhD is the Director of Education at the Heinz History Center.